Our Personalized Chocolate CD's are CD-LICIOUS! This is the ultimate party favor! Imagine your favorite image surrounded in our delicious Milk or Dark chocolate decorated with dancing musical notes! Your Chocolate CD will come in a plastic CD case, and adorned with a gold ribbon as shown in the picture. Just email us your picture, artwork or logo to info@candyundercover.com. If you have a particular design in mind, or see a design from our website that you like, we can add that too! 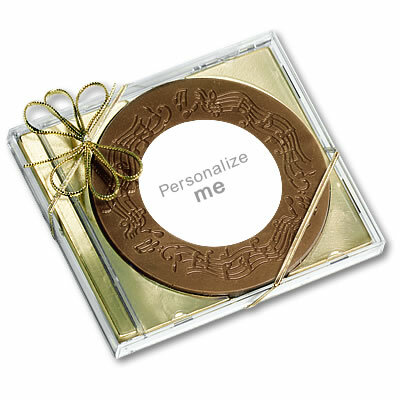 Our Personalized Chocolate CD Favors are the perfect party favor for any event. Great for Birthday Favors, First Communion Favors, Christening Favors, Sweet 16 Favors, Bar and Bat Mitzvah's, or any occasion you can think of! Just think how your guests will react when they see these beautiful and delicious Chocolate CD's. The entire image is edible. Makes for a fabulous edible party favor. Weight: 3.00 oz. Size: 5.00'' Packaging: CD case, insert, and gold ribbon.